Nobody waits for anything anymore. Why are you? TSA Pre✓® makes airport travel easier. No more winded sprints, panicked unpacking, or awkward belt removal. Just 5 years of stress-free security speed—and it takes less than 10 minutes to sign up. What are you waiting for? You can do so online or in person at any IdentoGO Center within six months prior to your KTN expiration date. Click "Renew Now" to check your expiration date. Speed through security for the next 5 years. 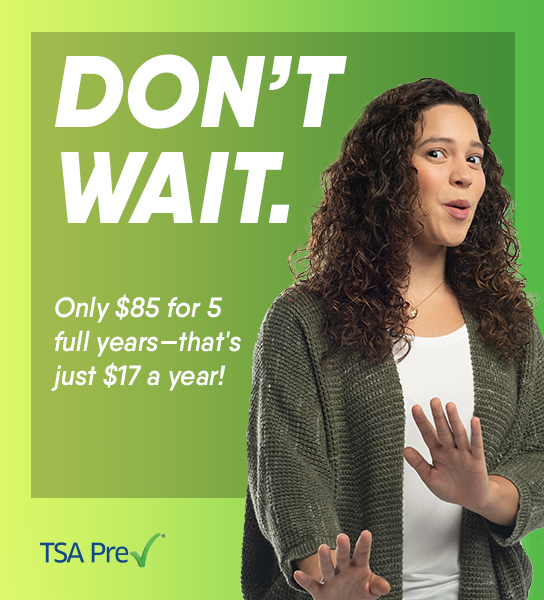 TSA Pre✓® allows approved low-risk travelers to experience faster, more efficient TSA screenings at participating US airport checkpoints for 5 full years—all for only $85. That’s only $17 a year for adults, and kids under 12 are free! There are hundreds of locations to get fingerprinted, so you can find one that’s convenient for you.